The Supreme Court was created by Article III of the United States Constitution, which stipulates that the "judicial power of the United States, shall be vested in one Supreme Court," and was organized by the 1st United States Congress. Through the Judiciary Act of 1789, Congress specified the Court's original and appellate jurisdiction, created thirteen judicial districts, and fixed the number of justices at six (one chief justice and five associate justices). Since 1789, Congress has occasionally altered the size of the Supreme Court, historically in response to the country's own expansion in size. An 1801 act would have decreased the Court's size to five members upon its next vacancy. However, an 1802 act negated the effects of the 1801 act upon the Court before any such vacancy occurred, maintaining the Court's size at six members. Later legislation increased its size to seven members in 1807, to nine in 1837, and to ten in 1863. An 1866 act was to have reduced the Court's size from ten members to seven upon its next three vacancies, and two vacancies did occur during this period. However, before a third vacancy occurred, the Judiciary Act of 1869 intervened, restoring the Court's size to nine members, where it has remained since. While the justices of the Supreme Court are appointed for life, many have retired or resigned. Beginning in the early 20th century, many justices who left the Court voluntarily did so by retiring from the Court without leaving the federal judiciary altogether. A retired justice, according to the United States Code, is no longer a member of the Supreme Court, but remains eligible to serve by designation as a judge of a U.S. Court of Appeals or District Court, and many retired justices have served in these capacities. Historically, the average length of service on the Court has been less than 15 years. However, since 1970 the average length of service has increased to about 26 years. 58 Oliver Wendell Holmes Jr.
99 Lewis F. Powell Jr.
^ a b While Willis Van Devanter and Joseph Rucker Lamar were sworn in as associate justice on the same date, their seniority (precedence) on the Supreme Court was determined by the seniority of their commissions—Van Devanter received and accepted his first—in accordance with XIII Rev. Stat. 9 § 674. ^ a b c d e f g h i As of April 17, 2019. This graphical timeline depicts the progression of the justices on the Supreme Court. Information regarding each justice's predecessors, successors and fellow justices, as well as their tenure on the court can be gleaned (and comparisons between justices drawn) from it. Additionally, The progression of presidents, along with the number of justices each nominated, is shown at the top of the timeline to give a more detailed historical context. There are no formal names or numbers for the individual seats of the associate justices, which are listed in the table below simply by number. Note that, due to the several changes in the size of the Court since 1789, two of the seats chronicled—"5" and "7"—have been abolished, both as a result of the Judicial Circuits Act of 1866. ^ Stathis, Stephen W. (2014). Landmark Legislation 1774–2012: Major U.S. Acts and Treaties. CQ Press. p. 122. ^ McMillion, Barry J.; Rutkus, Denis Steven (July 6, 2018). "Supreme Court Nominations, 1789 to 2017: Actions by the Senate, the Judiciary Committee, and the President" (PDF). Washington, D.C.: Congressional Research Service. Retrieved October 4, 2018. ^ Mears, Bill (January 1, 2010). "Chief Justice Roberts has little to say at year's end". CNN. Retrieved February 17, 2010. ^ Barnes, Robert (January 1, 2010). "Supreme Court Chief Justice Roberts opts not to ask Congress to raise judicial salaries". The Washington Post. Retrieved February 17, 2010. ^ Rowley, James (January 13, 2014). "Federal Judges in U.S. See $25,000 More as Salary Freeze Falls". Bloomberg. Retrieved May 28, 2014. ^ "Article III". Ithaca, New York: Legal Information Institute, Cornell Law School. Retrieved October 4, 2018. ^ "About The Supreme Court". Administrative Office of the U.S. Courts. Archived from the original on April 12, 2010. Retrieved February 17, 2010. ^ "Supreme Court Research Guide". Georgetown Law Library. Retrieved February 17, 2010. ^ Smith, Jean Edward (July 26, 2007). "Stacking the Court". The New York Times. Retrieved February 17, 2010. ^ Rosen, Jeffrey (February 26, 2008). "Dems' Choices For Bench Surprisingly Slim". CBS News. Retrieved February 17, 2010. ^ "Chief Justice John G. Roberts, Jr". Washington, D.C.: The Supreme Court Historical Society. Retrieved January 13, 2018. ^ "Justice Ruth Bader Ginsburg". Washington, D.C.: The Supreme Court Historical Society. Retrieved October 6, 2018. ^ Fram, Alan; Mascaro, Lisa; Daly, Matthew. "Kavanaugh sworn to high court after rancorous confirmation". AP. 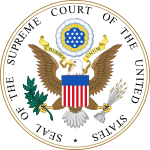 ^ "U.S. Senate: Supreme Court Nominations: 1789–Present". www.senate.gov. United States Senate. Retrieved November 11, 2016. ^ a b "Justices 1789 to Present". www.supremecourt.gov. Retrieved January 11, 2018. ^ "Members of the Supreme Court of the United States". www.supremecourt.gov. United States Supreme Court. Retrieved November 14, 2016.